I met haloumi cheese in the US, I never saw it in France nor Italy. Maybe because France has about 400 kinds of cheeses, so they don’t have any lacking in that category, you can eat one different cheese a day for one year! Isn’t that wonderful? I am wondering how they were able to come up with so many cheeses. Italian cheeses are great but they don’t have as a many varieties as the French. Even though I am not a huge cheese eater like most French people, I really enjoy and appreciate good cheese with great crunchy baguette. But this is not about French or Italian cheeses but about Cyprus and its wonderful haloumi. The particularity of this cheese is that it can be grilled and as I said comes from Cyprus, that little Mediterranean Island, even though it’s been considered European, it’s closer to Turkey and Syria. The Northern part has been occupied by Turkey since 1974, I guess there must be a heavy Turkish population and influence. 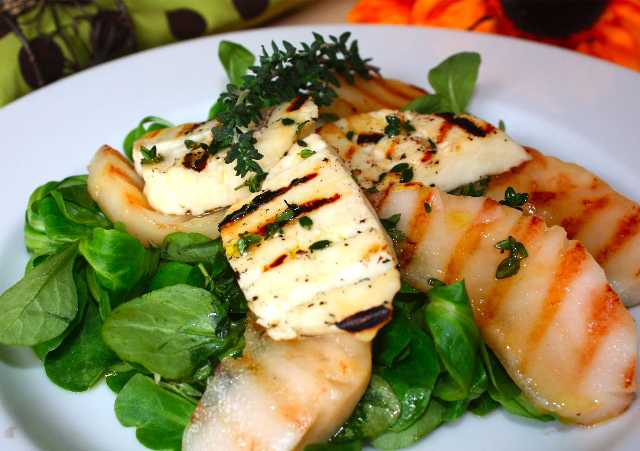 So haloumi is becoming more and more popular in the Mediterranean countries. It’s traditionally made with a mixture of goat and sheep milks and has a somehow salty taste. I really like it on salads with pears or grapes, but it needs to be served as soon as you grill it or the cheese tends to become rubbery when it cools down. Mâche salad is one of my favorite, it’s soft and tender and my parents used to grow it in their garden, so I remember when I came back from school my mom had always a huge bowl ready for me. The good thing is when you buy it, it’s already cleaned, so you don’t have to go crazy cleaning the earth that got inside the leaves. The washing and cleaning process is not an easy one. First prepare vinaigrette, by mixing lemon juice, olive oil, thyme, salt and pepper together. Then, grill pears in a grill pan, then set aside. Grill haloumi. In a plate, place some mâche, top with one slice of pear alternating with one slice of haloumi and drizzle with vinaigrette. You can make extra vinaigrette and toss some salad in it, then with the rest you can drizzle on top of pear and haloumi slices. This entry was posted by silvia on November 11, 2009 at 11:17 pm, and is filed under Salads, Vegetarian - dairy. Follow any responses to this post through RSS 2.0.You can leave a response or trackback from your own site. Great salad you have here. I agree that you have a lot of cheeses. I can’t remember that other name for mache. But I love it. Oh wow, yum! I don’t think I’ve had haloumi, but I love most any cheese, so I’d be more than willing to have this for lunch! This looks awesome — I have never tried Haloumi do you think Whole Foods would carry it? I love the brightness of Mediterranean flavors, thanks for sharing! I was just thinking about Haloumi cheese last night. I’d love to try this! I find haloumi a little too salty at times but I still love it grilled. And it is a good combination with pear! I’ve heard of haloumi, but have not yet tried it. I like the idea of it being sturdy enough to grill. Will have to give it a whirl if I see it in a store! Que c’est une salade magnifique. Je n’ai pas encore goûté au Haloumi. Je dois essayer bientôt. It’s a grilling cheese from Cyprus, delicious. Yes I bought mine at Whole Foods. Don’t know if all whole foods do carry the same things all over the country, but you could try. I have seen it at a local Safeway too in SF. Thanks!! I know, imported cheeses are quite expensive. I have seen haloumi at Safeway but it was the same price. And I have never tried haloumi cheese. Great info. I’ll put it on my “must try” list! Your posts are always such a nice treat to read! Thank you!! !Mache is a pretty salad too. Yes memories are always such a great way to stay in touch with our past and revive it. I guess I am nostalgic so I often cook things that remind me of my childhood.